Evergreens play a vital role in the garden at any time of year – but it is in winter when they perform at their best. They become the ‘back bone’ in our borders and give them shape and structure when everything else around them has died back and lost it’s leaves. Many people find them boring and insignificant and unable to get excited about. However, choose with care and you can create something modern and architectural that will sit easily in any contemporary setting. 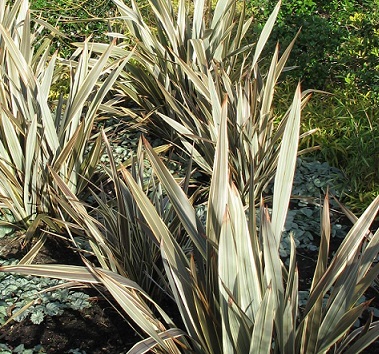 This group planting of Phormiums makes a dramatic statement in winter sun. As a garden designer in Hitchin, they are a versatile evergreen that I like to use in people’s gardens. With their increasing number of colourful varities you can have fun with your colour palette as well! it will be covered in tiny unassuming white flowers that have the most amazing vanilla scent. In fact many people consider Sarcococcas to have one of the strongest winter perfumes of all plants. They prefer partial to full shade which is useful if you have a dark corner or doorway that you will walk past in the winter months and catch their smell. The National Trust garden at Anglesey Abbey has many Sarcococca planted in it’s Winter Garden. My favourites though are those planted in one long line almost as hedging in the carpark. You have to walk past them to get in to the entrance which to me is perfect planting. 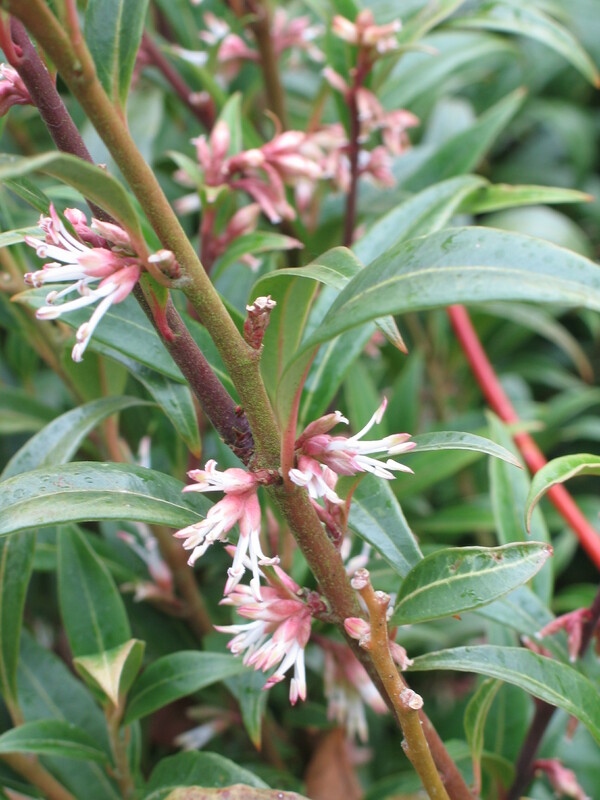 There are a variety of Sarcococca to choose from varying in size and habit. My favourite is Sarcococca hookeriana var. digyna ‘Purple Stem’ for it’s new shoots that are flushed with an attractive purple hue. Evergreen shrubs are essential in a garden but so are those that climb or provide ground cover. There are many honeysuckle, clematis and pyracantha that will give a vertical interest in the winter months to. Alternatively put evergreen shrubs or grasses in pots and place them on the patio where you will see them. 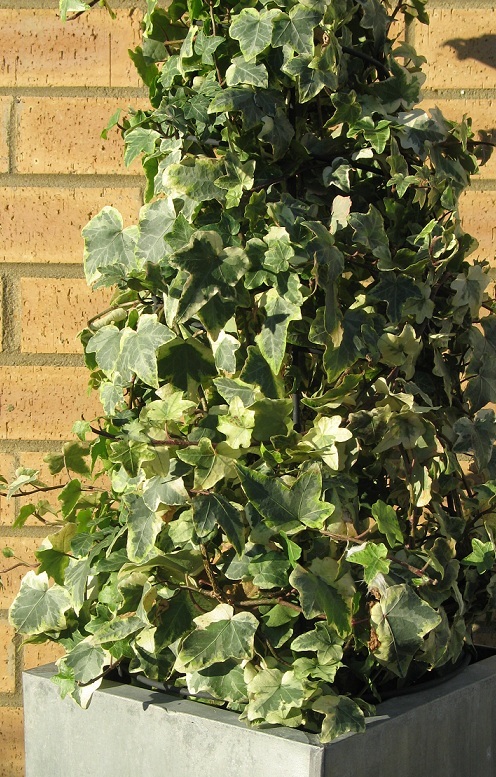 Many people like to place an evergreen in an attractive pot beside their front door and I think this trained ivy growing over a support works well, is easy to maintain and relatively cheap.